Beginning Thursday, December 12 at 10 am, a holiday festival will kick off at the North Carolina State Capitol and the festival will continue until 3 p.m., December 14. Local performing groups will be providing ongoing entertainment at the festival, which will have activities on Union Square, at various museums and on Bicentennial Plaza in Raleigh, NC. The Junior Women’s Club of Raleigh is hosting the activities at the different sites as well as serving winter themed refreshments that will include hot chocolate and cookies. Local Girl Scouts will be wandering about while collecting non-perishable food donations and singing Christmas Carols. Visitors will love the huge old-fashioned tree in the museum lobby and playing with the historical toys and games. Special activities will be available December 12-14 from 10 a.m. to 3 p.m. each day including making old-fashioned paper Christmas tree ornaments that can be taken home. Unique tree ornaments of North Carolina will be available as keepsakes from the museum gift store. Special appearances of local sports team mascots will get the holiday spirit moving. Santa should be able to come just before the tree lighting ceremony. Local food trucks will open for business between the Capitol and state museums. The Junior Woman’s Club will again be serving their delicious cookies and hot chocolate. 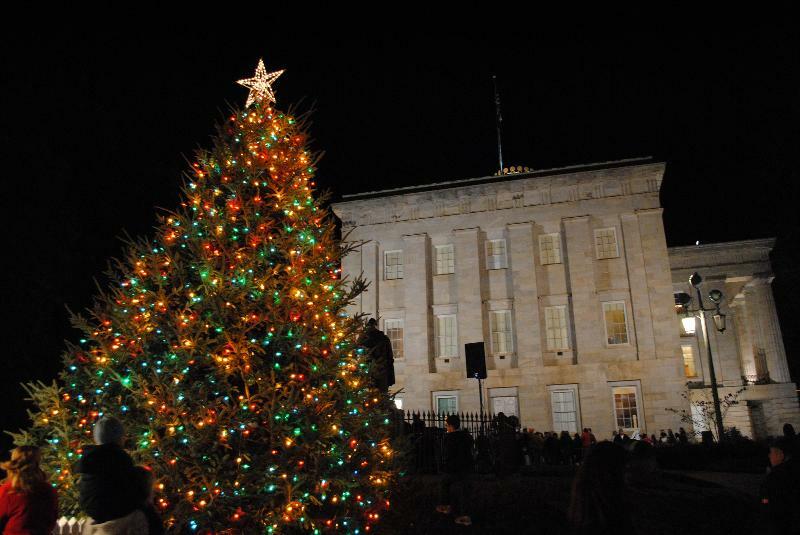 Beginning at 5 pm on Thursday, December 12, a dazzling array of lights will be illuminated on the grounds of the State Capital in Raleigh North Carolina. While the area is coming alive with twinkling lights, different musicians will be performing with energy and holiday spirit as darkness falls. The Raleigh Concert Band, Raleigh Boys choir, Farmington Woods Hand bell choir and the Wake Med Chorus are expected to perform. Once the plaza is lit, Governor Pat McCrory and the First Lady Ann McCrory will carry out the traditional tree lighting ceremony on the south plaza. The Capitol Christmas Tree at 24 feet in height is the flagship Christmas decoration that when lit officially begins the holiday season for Raleigh North Carolina. Following the tree lighting ceremony, visitors are invited inside the Capitol for an open house to admire the holiday decorations of the Capitol interior, which have been supervised by the Raleigh Garden Club. In the Rotunda, a 20 foot Frazier Fir which is a North Carolina specialty will be decorated with 100 ornaments representing each county of North Carolina. The North Carolina Christmas Tree Association donates hundreds of wreathes to decorate official state property for the holidays and many will be displayed during the festival at the Capitol.